Is it noisy and is it safe for appliances? Do you enjoy uninterrupted electricity power supply? Do you also enjoy camping or maybe you are living where access to steady power is a challenge? Then you are one of those that need to know about the WEN 56200i. Power generators are alternative sources of power supply to power up your house or anywhere you intend to take electricity to. There are a lot of generators out there with big names and pricey price tags that can easily discourage you from getting one. But not the one we have picked out to review today. We are talking about WEN 56200i Portable Generator. This generator can keep your home warm and to also power electrical items in your homes. This portable generator is such that you can easily lift and carry about. Without much further ado, let’s look at the features of WEN 56200i. First thing you need to know is that you need to change the engine oil from time to time. Also ensure that routine check or visual check is done on your generator to be able to detect when something is not right. You don’t have to wait until the generator stops working before checking it out. You detect a minor issue and nip it in the bud and by so doing preventing the issue from escalating into more serious issues. Always contact the manufactures or where you bought the generator from should you have problems with a part of the generator. You should not try to repair it yourself. Check for parts that are loose so they can be tightened back. 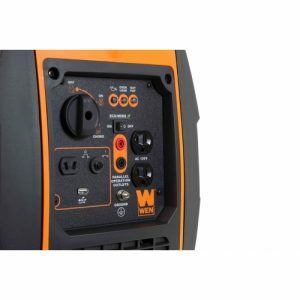 There are other things you need to know about WEN 56200i and that is that it is extremely quiet when you compare it with other portable generators. It is so quiet that it has been compared to be the same range with people conversing at 51 decibels. It has total harmonic distortion. What this means is that all that will be powered with the WEN 56200i will be safe as long as it is within the wattage of the generator. WEN 56200i is very portable and not one to grapple with. It only weighs 48 pounds and has a sturdy handle that you can carry about without knowing. With one gallon of gasoline, you can have the WEN 56200i up and running for four hours. It really depends on what you are running at the time. Now for a 2000 surge watt generator with a starting watt of 1600, that’s a good bargain. 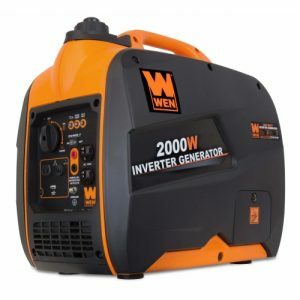 Having talked about WEN 56200i Portable Generator so much it’s time to see its pros and if it has some cons as well. We have said so much about WEN 56200i. We think it is a good generator that has gotten tons of positive reviews from people that have bought it. It is also quiet easy to use and not such that has many complications. What we love very much about it as well is how light it is. You can carry it along with you while trekking without realising you are carrying a generator. That is a far cry from the old generator that we are used to. This one sure backs on a lot in a small body. 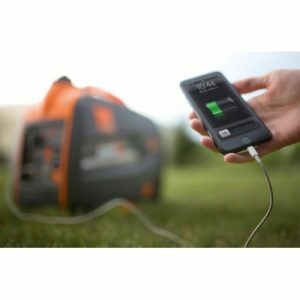 It is also safe in charging your fragile electronics like tablets, phones and every other gadget that you wouldn’t have been free to charge with other generators. Besides that, WEN 56200i is very quiet generator that you won’t be blown off with terrible sound coming from it. Many people dread generators because of the noise but not Wen 56200i Portable Generator. Now when we looked at the price it is going for, we realised it is a fair deal. Not many generators as portable as this and with all that it has to offer can be gotten at that price. There is really nothing bad apart from the points we mentioned in the cons which aren’t really a bid challenge. You will be making a good choice with some peace of mind when you go for it. 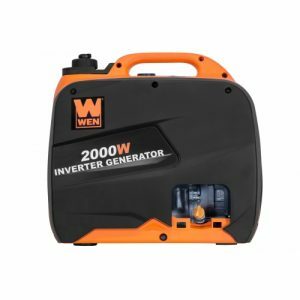 My father bought the wen 2000 generator for us after using it successfully for more than a year and it makes all the difference in the world. It’s quiet, reliable, strong and easy to throttle around even for me and I weigh around 110 pounds.